Children, their World, their Education is the definitive text for students, teachers, researchers, educational leaders and all who are interested in primary education. As the culmination of the Cambridge Primary Review, the most comprehensive enquiry into English primary education for half a century, its publication provoked instant and dramatic headlines. Widespread support from teachers and eminent public figures demonstrated that the book had identified the issues that really mattered. Ministerial unease showed that here were findings that politicians could not ignore. But Children, their World, their Education is much more than a report. It is an unrivalled educational compendium that systematically covers the issues that are central to the daily work of students, teachers and heads. For trainee teachers on undergraduate and postgraduate courses it effectively maps the territory of primary education and provides the context, information and insight which are essential to the development of classroom skill. Its vast range of carefully evaluated evidence makes it a core resource for those undertaking research and advanced study. Its direct engagement with the policy process during a period of unprecedented change makes it an indispensable tool for policy analysis. It places England’s education system in the global context, and combines evidence on recent developments with a vision of how primary education should be. Part 1 sets the scene and tracks primary education policy since the 1960s. Part 2 examines children’s development and learning, their needs and aspirations, and their lives in a diverse society and fragile world. Part 3 explores what goes on in schools, from the vital early years to educational aims and values, the curriculum, pedagogy and classroom practice, assessment, standards and school organisation. Part 4 deals with the system as a whole: educational ages and stages, the work and training of primary teachers, school leadership, local authorities, funding, governance and policy. Part 5 pulls everything together with 78 conclusions and 75 recommendations for policy and practice. 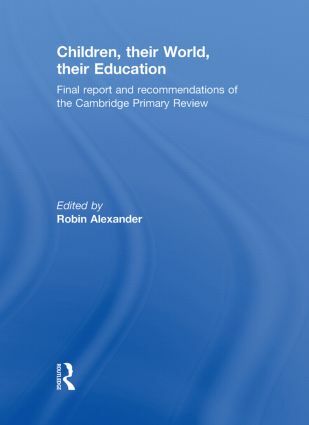 Companion volume: The Cambridge Primary Review Research Surveys, edited by Robin Alexander with Christine Doddington, John Gray, Linda Hargreaves and Ruth Kershner. The Cambridge Primary Review is supported by Esmée Fairbairn Foundation: www.primaryreview.org.uk. Robin Alexander is Director of the Cambridge Primary Review, Fellow of Wolfson College, University of Cambridge, and Professor of Education Emeritus, University of Warwick, UK. Michael Armstrong is a writer and former Head Teacher of Harwell Primary School, Oxfordshire, UK. Julia Flutter is Research Associate at the Faculty of Education, University of Cambridge, UK. Linda Hargreaves is Reader in Education, University of Cambridge, UK. Wynne Harlen is Visiting Professor at the Graduate School of Education, University of Bristol, UK. David Harrison is former Research Associate at the Faculty of Education, University of Cambridge, UK. Elizabeth Hartley-Brewer is a social policy consultant, parenting adviser, journalist and author. Ruth Kershner is Lecturer in Education, University of Cambridge, UK. John MacBeath is Professor of Education, University of Cambridge, UK. Berry Mayall is Professor of Childhood Studies at the Institute of Education, University of London, UK. Stephanie Northen is an education journalist and editor. Gillian Pugh is Chair of the National Children’s Bureau and Visiting Professor, Institute of Education, University of London, UK. Colin Richards is Emeritus Professor, University of Cumbria, UK, and a former primary HMI. David Utting is a writer, researcher, policy analyst and former Associate Director at the Joseph Rowntree Foundation, UK.